The cottage was built in 2002, 2003 and completed in 2004. The house is 123 m2, of which 18 m2 loft. The house is heated by underfloor heating and has in addition a great stove in the living room. There is a 300 liter water heater, so there should be enough for everyone. Are you between 12 and 20 people, or have a need for extra space or rooms, so you can rent our annex in addition. Here are 8 beds in three rooms. - Technical room with washer and dryer. - 2 bathrooms (shower), of which one with sauna. - Combined living / kitchen / dining area, built so that everyone can be collected regardless chores. We suspect that conversation kitchen is 'stolen' from our drawings. 2 rooms with a couch where 'pull-out drawer' is a bed in itself, and one cupboard. 1 room with a bunk bed, a dresser and ample space under the bed. 1 double sofa bed in the loft (150 cm). There are no closets, but plenty of room on the floor. The living room is a part of our kitchen / dining / living solution. There is a large dining table and 12 chairs. The chairs are specially selected not as dining chairs but as conference chairs that makes you sit longer in them without tiring. If required there may be two of the table, bringing the total number of persons of honor up on the 14th It is actually possible to move the dining table and chairs from the annexe to the main house, so there may be 20 people on the same table. What then is left can be called living room. It consists of two 2-seater london sofater, 1 armchair and a glass table. In this part is also the TV so it can be seen from across the room. If it is a problem with your TV, then there is one for the loft. We have always used the space in the loft as the children's room. Here they can be themselves without us bothering each other - even on a rainy day. And yes we have boys. The kitchen is built as the central part of the cottage. We have always used the house (also our old cottage) to gather family and friends for some good food. Therefore, the kitchen has always been the center and it is in our kitchen / living room. One wall of the room contains the country kitchen, while an island located in the middle of the room can also be used as a 'bar' for those who do not actively participate in the dinner production. The plot is 1608 m2, and the outer strap against neighbors planted with the original forest, but trimmed some of the worst wild roses and dead trees. The driveway is covered with gem stones, also located in dobbeltcarporten. There is room for another car in the driveway without obstructing the other. If there are more than 3 cars, these moves when the inner shell out. Alternatively, the blind road (turn square) bordering the land used for parking for 2 cars further. There are tiled walkway from the turning space to the house. On the south side of the house is a large square lawn with 'forest' on the three sides and terrace and the house on the fourth This means that the grass is not immediately seen on roads or neighbors. There are two goals on the grass so the kids can play some ball. There are three terraces one suite. Breakfast terrace, located to the southeast with wooden furniture for 8 people, and sun from morning to mid-afternoon and lying directly to the lawn. The large terrace is located on the southwest side of the house with plastic furniture for 12 people. The large trees ensures that there is almost always a shady spot on the terrace, and the size ensures that there is always sun (when it shines, of course). The covered patio is related to the annexe. Here only the sun in the morning and there are plastic furniture for 10 people. There is a brick barbecue in the large terrace. One bathroom has in addition a sauna. Around smoking, smoking is only allowed in the large living / sitting room. Out of the small rooms and bathrooms. There are tiled floors, so hair after dogs, etc. should not bother subsequent tenants with allergies. Et dejligt område og fint sommerhus, som på alle måder lever op til det, der er beskrevet. Solen skinnede så smukt og matchede det fine gul hus på skønneste vis. Tak for lån. Très beau chalet près de la mer. Le chalet est beau, fonctionnel et très bien équipé. Les chambres sont petites mais le séjour et les terrasses sont grands. La mer est toute proche et l'accès à Copenhague en un peu plus d'heure, est facile. Accueil parfait, d'une grande gentillesse. Vi er en flok kvinder som engang om året tager en forlænget weekend i sommerhus. Vi valgte i år sommerslottet og har været der før. Super sted, hvor alt er i orden. Der er pænt, rent og der er alt det der skal være af udstyr i huset. Alle de værelse, gør det nemt for os, for så kan vi alle sammen have enkel værelse. Omgivelserne er også rigtige gode og der er noget at se på. Så vi kommer helt sikker tilbage på et tidspunkt. Vi var en flok selvstændige, som var afsted på arbejdsweekend, hvor vi skulle arbejde med vores egen forretningsudvikling og sparre med hinanden. Huset er ideelt til formålet, da det har mange værelser, et velassorteret køkken, som kan klare mange mennesker, samt ikke mindst et dejligt stort spisebord, hvor vi kunne arbejde med vores pc’ere, hvis man ikke lige ville sidde i sofagruppen. Udlejer havde ovenikøbet været så flink at sætte en flipover frem til os. TV’et har også et HDMI kabel, men vi fik desværre ikke lige tjekket, om vi kunne præsentere på TV-skærmen fra vores pc. Det er et dejligt og hyggeligt sommerhus, som ligger tæt på stranden, hvor vi kunne få inspiration på gåture i den friske luft. Helt klart et sted, som vi gerne vil tilbage til. Helt igennem dejligt sted, som vi uden tvivl vil besøge igen. Udlejer var meget behjælpelig ved tvivls spørgsmål og der var alt hvad der skulle være i huset. 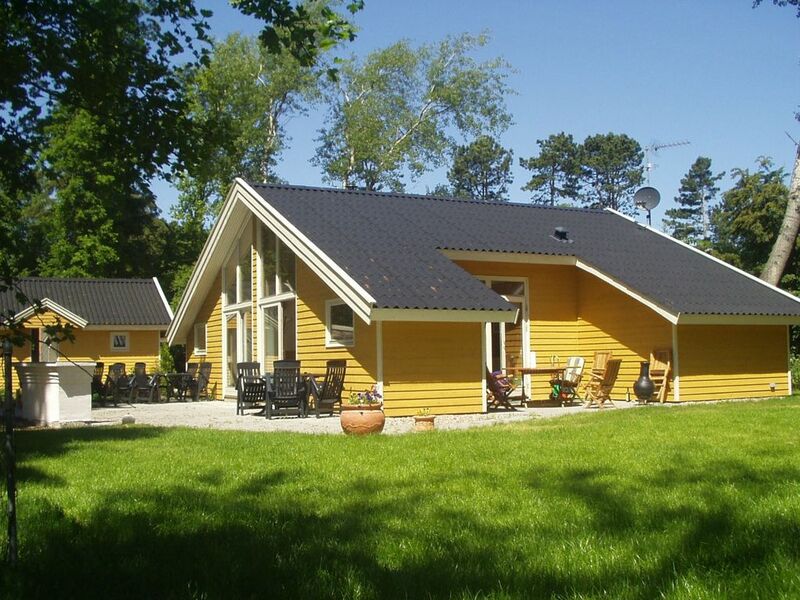 The house is located on the parched Klintesø, right on the edge of a holiday home area from the 60s. On the other hand, are mostly untouched vegetation, except for a single newly developed straight for us. The reason lies about at the level of the sea level, but a hill between land and sea makes that there is no risk of flooding or the like, while always warm even when it blows from the sea - the wind goes simply over. The beach is only 300m from the house, and is a mixture beach with both pieces of fine sand and pieces of stone. About 1 km to the right down the beach it becomes a clean sandy beach, as well as to the other side is a wooden pier in addition to the stone lying there. Going for a walk in addition to the drained lake early morning or when the autumn wind shakes are fantastic, there are both roe deer, foxes, hares and a multitude of birds. There is a connection from the fields of Klintesø and the proximity of the stretch Sonnerupskov. Which is still an active port in the morning when the recreational fishermen and a single professional fisherman land the catch, or when anglers cast your line in the hope of both the one and the other. Our local SPAR is about 1 km from here in Nyrup. Additionally, there are grocery stores with extra hours in both Højby and Nykøbing. A town with very lively trade and many shops. Especially on weekends and in the summer is the pedestrian zone very active. All who are close to are also further away, and often on a large scale, as the port of Rørvig or Odden, the large state forests found in several places in Odsherred, one of the best beaches in Sejerø Bay. Strom aus Zähler, mit DKK 3,- pro k/w. - End Reinigung DKK 1.000,- (Optional) El efter forbrug, med DKK 3,- per kw/t. - Slutrengøring DKK 1.000.- (Valgfri) Electricity after meter, mit DKK 3,- per kw/h. - . End Cleaning DKK. 1.000,- (Optional).